Can you believe? JVN is coming to Dublin in October 2019 and we want to gift you with a pair of tickets to see the show! Competitions 30 January, 2019 . Written by Katie Donohoe. 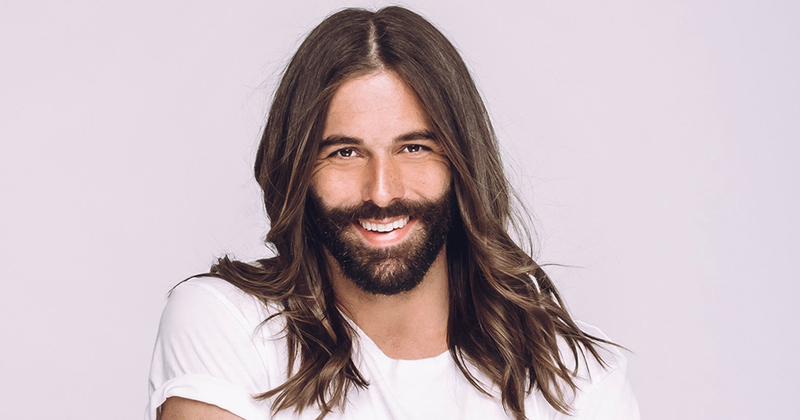 Jonathan Van Ness brings his stand-up tour to Dublin’s Olympia Theatre on October 16 2019. Due to phenomenal demand, an extra late show has been added to his Dublin date with tickets on sale now. It is his belief that great hair is best served with a side of witty banter. Jonathan can be seen starring on Netflix’s “Queer Eye,” which premiered in February 2018; the hit reboot of the Emmy Award-winning series ‘Queer Eye for the Straight Guy’. The show, which is Netflix’s first foray into non-scripted, follows the ‘Fab Five’ as they forge relationships with men and women from a wide array of backgrounds and beliefs often contrary to their own, touching on everything from LGBTQ rights and social commentary to how to make the best farm-to-table guacamole. Jonathan shines as the show’s groomer, hair guru and self-care advocate. “Queer Eye” is set to return for Season 2 on June 15. In addition to ‘Queer Eye’ Jonathan stars on the Emmy-nominated series ‘Gay of Thrones’, (Funny or Die), a witty social commentary series recapping HBO’s ‘Game of Thrones’. Launched in 2013, the series is now in its seventh season and garnered an Emmy nomination in 2016 for ‘Outstanding Short Form Variety Series’. Jonathan also continues to work on a passion project, his podcast ‘Getting Curious’, a bi-weekly exploration of all the things Jonathan is curious about from the history of the Armenian Genocide to the opioid crisis in the U.S.
Born and raised in Quincy, Illinois (a small town on the Mississippi River about four and a half hours southwest of Chicago). Jonathan is the sixth generation of a family rooted in the media business that owns and operates broadcast, digital and newspaper operations in 17 markets. Given his family history, Jonathan spent his childhood in the newsroom, cultivating an organic love for social issues and current events. He went on to attend college at the University of Arizona, where he cheered competitively for a year then quickly realized he longed to follow his true passion; hairstyling and beauty. He enrolled at Aveda Institute for Hair, where he learned how to cut, style, and colour hair. Jonathan then moved to Los Angeles and landed a role as an assistant at the Sally Hershberger Salon (famous for creating Meg Ryan’s shag cut). Next, he ventured out on his own having grown his own clientele while also working as a groomer for HBO on series including ‘Game of Thrones’ and ‘True Blood’. In 2013 Jonathan launched his own salon studio in LA, Mojo Hair with business partner Monique Northrop. His celebrity clientele continued to build, working with names such as Margaret Cho, Denise Bidot, Tess Holliday, Kit Harrington, Jeffrey Self, and Esme Bianco, to name a few. He can also be found on the east coast monthly, taming tresses at Hairstory Studio in NYC on Fifth Avenue. While working on ‘Queer Eye’, ‘Gay of Thrones’, ‘Getting Curious’ and hair styling keeps Jonathan busy, he still makes time throughout the week to do Yoga and can be found working out at Equinox on the regular. He also continues to have a love for reading the news and has a habit of going impulse shopping. He currently splits his time between LA and NYC. Jonathan Van Ness stars in which series that earned an Emmy nomination in 2016 for ‘Outstanding Short Form Variety Series’? Sign up to our weekly GCN Digest newsletter! 30 January, 2019 . Written by Katie Donohoe.